The remaining events in the 2010-11 lineup of competitions are Hickstead, England later this month, Palm Beach in the United States next winter and the final in Munich, Germany in May, 2011. The award after the first year went to Edward Gal of The Netherlands. 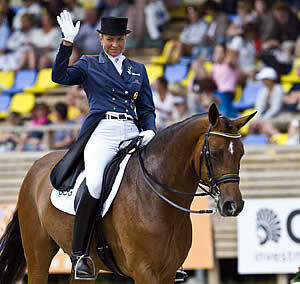 WDM utilizes marketing strategies and innovation to enhance the sport of dressage worldwide. WDM is sponsored by Exquis, Moorland Stables and Moorland Investments, Nürnberger Versicherungsgruppe, Jerich International and Axel Johnson Group.